Tina's Crop Shop: PCC 236 Shaker Card You're Nauti-Cool! PCC 236 Shaker Card You're Nauti-Cool! Of course, since it is Wednesday, it's time for another Paper Craft Crew and this week we have another fun sketch. I just received the fun new Fun Stamper's Journey Stamp Set "Under The Sea" so I had to make a shaker card with an under the water scene! I stamped and colored all of the images from this fabulous stamp set so look out.. there will be more cards. These images were heat embossed with Gold Embossing Powder and colored with Kuretake Zig Clean Color Markers and an aqua brush. My background for the under water scene was a piece of Neenah Crest Solar White 80# cardstock that had Broken China and Peacock Feathers Distress Ink blended onto it. I spritzed it with water once done so get some pitting in the color and add some interest. It looks super cool up close. 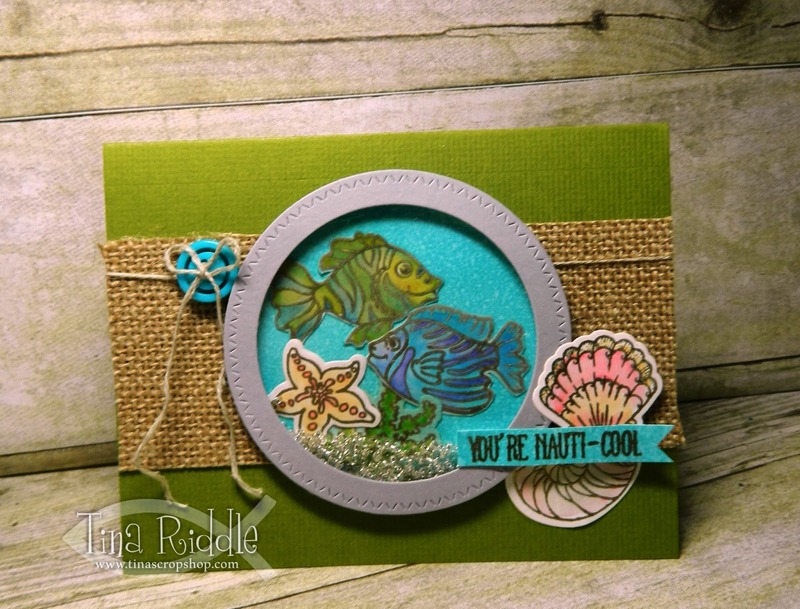 The sentiment You're Nauti-Cool is from the Avery Elle "Knotty" Stamp Set. It has some awesome nautical sentiments that I love to use. Tina, totally love your design! Under The Sea.. Just Because! OSAT Blog Hop - Birthday Bash! PCC233 Tic-Tac-Toe Shabby Chic Card!